Reasons to love Halloween: Pumpkin carving, scary movies, hayrides, insane amounts of candy, and most importantly, costumes. Full disclosure, I start thinking about my next Halloween costume on November 1st — and not just about the actual clothing. I’m talking about the whole look, from head to toe. And as anyone knows, no costume is complete without the right Halloween makeup. What’s a vampire without pale skin and a bloody mouth? Or Cleopatra without eyeliner? Nada. It’s a basic rule, as old as the laws of physics(ish): You need great makeup to create a great Halloween costume. 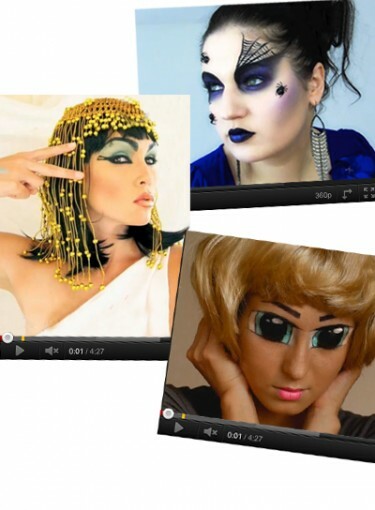 Click here to view the top Halloween makeup tutorials on the web. Now, I have access to some of the top makeup artists in the industry, but for Halloween makeup tutorials that us mere mortals can actually do, I turned to the real girls on YouTube. Their makeup looks ranged from the scary to the cute, the elegant to the outrageous. These ladies aren’t messing around when it comes to creating an amazing Halloween look. Check them out. Then tell us: What’s your favorite Halloween makeup look?